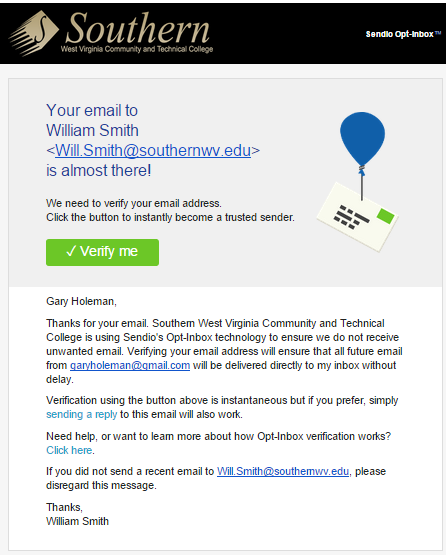 Southern employs an advanced email filtering system from Sendio that scans email for viruses and classifies email as being from a bulk email sender or a mailing list or from an individual. This system maintains a list of email addresses for you personally that are in your “trusted community” or Sendio’s Opt-Inbox. When an email is sent to you from an address that has passed all the spam email scans, but is not in your trusted community, an email is sent back to that sender’s address asking them to verify their email address. An example of that email is shown in the figure to the right. As is explained to the sender in the email, they need to click the Verify Me button or reply to this email to have their address verified as coming from a human. Spam email systems will not respond to this request for verification and their emails will be held by Sendio and not be delivered to your Southern Inbox. When the sender verifies their address, their email is then delivered to your Southern Inbox. You have the ability to login to Sendio by browsing to http://sendio.southernwv.edu and providing your Southern email address and password at the login screen. On Messages, under the Inbound Messages tab, you will see, by default, all email messages that are pending delivery and have not yet been sent to your Southern Inbox, as shown in the figure below. Those pending messages that are marked with an L are properly formed messages from a mailing list that has an unsubscribe link in them. To see why a particular message has not yet been delivered, double click the message, then press History on the next screen. The example below shows a message that is being held until the sender verifies their address. 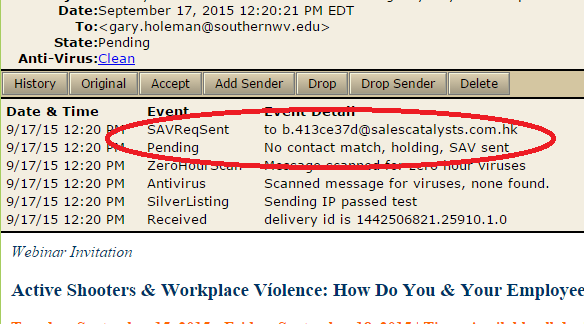 The line that says “Pending” shows that this sender is not in the trusted community (“No contact match”) and that an SAV (Sender Address Verification) was sent. If you press the Accept button, this message will be delivered to your Southern Inbox without adding this sender to your trusted community. If you press Add Sender, then the sender is added to the trusted community and this and all future messages from this sender will be delivered. If you press Drop, this message will be deleted from your pending messages. If you press Drop Sender, then this message is deleted and this sender is permanently blocked from sending email to you even if they previously were in your trusted community. You can directly view and manage your trusted community by clicking on Contacts. The list of contacts below shows both trusted (green - ) and untrusted (red - ) contacts. Anyone to whom you have sent an email is automatically added as a trusted contact. You can manually delete them or change them from trusted to untrusted or vice versa. To delete the contact, press the check mark next to their name, press Actions and press Delete Selected Contacts. If a sender has previously responded to a request for address verification, deleting their contact is not a good approach. This sender will become an unverified contact and the next time they send an email, they will be asked again to verify their address. If, on the other hand, you double click their name and change Accept to Drop beside Action, they will become an untrusted contact and all future email from them will be rejected. You can manually add a contact from this screen by pressing New and filling out the subsequent form. Any contact in your list of contacts will not be asked to verify their address. There are other views of your pending messages available. By pressing Messages and on the Inbound Messages tab pressing View, you can change from the default view that shows pending messages that are not classified as bulk messages to several other views. By selecting “Pending messages, show bulk”, you can see pending messages that have been determined to have been sent by bulk senders. Bulk messages are normally those sent by spammers. The figure below shows pending messages including one bulk message. The icons show that this message was sent from an email server that is known to be disreputable and is known to send spam. The black “IP” icon ( ) indicates a disreputable mail server (“bad IP”). The B icon ( ) indicates a bulk message. The exclamation point icon ( ) indicates a message that violates policy and will not be delivered. What if a real person sending me a message ignores the request to verify their address? Their email will sit in a pending queue waiting on the sender to verify their address. You can view the emails that are pending and can, if you wish, accept the sender’s address into your trust community, bypassing the need for the sender to verify their address. See the instructions above. Do I need to actively monitor the pending email? Not necessarily. For most people, you can rest assured that your incoming email is being scanned for viruses and classified appropriately and never log in to Sendio. If a new email sender to you ignores the request for address verification, it probably means it isn’t that important an email and you might not care. You may, however, wish to take a more proactive role in managing your email by monitoring your pending messages and trusted community following the instructions above. You will also receive, by default, a daily email showing a summary of your pending email. You can make the choice as to how active you want to be in monitoring your email. Can I opt out of having my email handled this in fashion? No. Emails phishing for authorization credentials pose a security threat to Southern and we must proactively block potentially dangerous email. Unwanted email also wastes college resources in terms of hardware, software, IT management and lack of productivity of users. Though there is the risk of inadvertently holding valid emails, that risk is outweighed by the benefits of reducing costs. If you are expecting an email that you do not receive, you can always find the email in Sendio and release it to your mailbox. New Contacts - This is a list of contacts (email senders) added to your trusted community of email senders in the last 28 hours. They were added either specifically by you or by the sender responding to a Sender Address Verification email to prove that a human sent the email. The only option you will have is to Drop this contact. So, if someone sends you an email that is not in your trusted community (Opt-Inbox) and they successfully respond to the Sender Address Verification, they will be added as a trusted contact and the pending email from them will be released to your mailbox. If you do not wish to receive any further emails from this person, you can press Drop to change their contact from Accept to Drop. Or, in other words, from a trust contact to an untrusted contact. New Pending Messages - These are new messages sent to you by someone that is not in your trusted community. You can press Accept or Drop here to decide what to do with this message. Whether you press Accept or Drop, you will be asked if this action should be applied to all messages from this sender or just this one. Applying it to all messages creates either a trusted or untrusted contact in your community. New Pending Bulk - Bulk messages have been categorized as coming from a bulk mail provider. Only rarely will you want to accept a message from a bulk message sender, so be careful about accepting these. If you aren't sure, do not accept them. Can I opt out of receiving the daily Queue Summary email? Yes. At the bottom of every Queue Summary email, there is an Unsubscribe link you may press to discontinue receiving the daily Queue Summary emails. This does NOT opt out of using Sendio to catch spam email. There is no way to opt out of having your email handled this way. If you accidentally unsubscribe from the daily Queue Summary email, you can login to Sendio at http://sendio.southernwv.edu, press Account Info and then press Subscribe under Queue Summary. We recommend that you receive this Queue Summary email.